Bearing strong similarities in texture and appearance, curd and yogurt are mostly used interchangeably. But while both are by-products of milk, there are significant differences between the two. A dairy product obtained by coagulating milk, curd is the end-product of curdling. During the process, milk coagulation is aided by adding an edible acidic product to milk. The acidic substances used to produce curd include vinegar or lemon juice. Additionally, curd is also formed by adding lactic acid bacteria to pasteurized or raw milk. High in nutritional value, it can be eaten on its own or along with sandwiches and salads. Yogurt, on the other hand, is a dairy product produced by bacterial fermentation. The bacteria used to aid milk fermentation is called “yogurt cultures,” which include Streptococcus thermophilus and Lactobacillus delbrueckii subsp. bulgaricus. 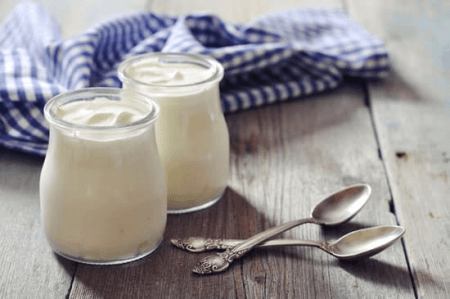 The distinct flavor and texture of yogurt is the result of the interaction of milk protein and lactic acid during fermentation. To counteract the natural sourness of yogurt, additional flavorings and fruits may be added the dairy product. It is typically used as a substitute for heavy cream, and it can be eaten on its own or along with fruits and other desserts. So what’s the difference between curd and yogurt? Although these products bear similarities, they are completely different in a number of ways. Firstly, curd and yogurt are end products of different chemical processes. Derived from the process of curdling, curd is produced by adding edible acidic products such as lemon juice and vinegar to milk. Alternatively, adding lactic acid bacteria to raw or pasteurized milk can facilitate milk coagulation and produce curd. Yogurt, on the other hand, is a product of bacterial fermentation. It is formed by adding yogurt cultures such as Streptococcus thermophilus and Lactobacillus delbrueckii subsp. bulgaricus to milk. The fermentation of lactose releases lactic acid, which contributes to yogurt’s taste and texture. Since curd and yogurt are a by-product of milk, both dairy products are a good source of calcium and other essential vitamins and minerals. However, there are still differences in their caloric content. A 100-gram serving of curd and yogurt amounts to 98 calories and 61 calories, respectively. Curd and yogurt are distinct for their sour and tangy flavor. However, curd is slightly stronger in terms of acidity. Unlike yogurt, curd can squeak against the teeth. Lastly, both curd and yogurt can either be eaten alone or along with other food items. 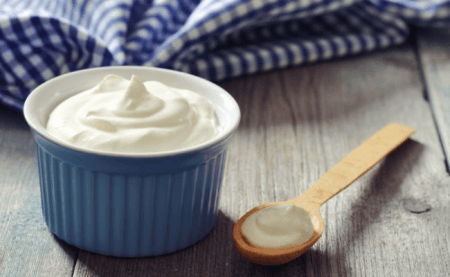 Curd is typically used as a dressing for salads and sandwiches, while yogurt is used in preparing healthy snacks and desserts. Yogurt also acts as a substitute for heavy creams.